Congratulations on choosing to remodel your kitchen or bath! There are many items to consider when remodeling. Let us help design and create your new kitchen or bath! THIS WILL HELP US DETERMINE HOW MANY SQUARE FEET OF COUNTERTOP SPACE YOU HAVE! 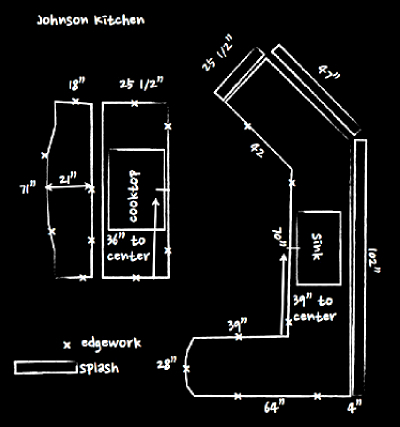 Take some paper and draw out your current kitchen or bath layout. (Remember, it doesn’t have to be perfect!) Then, take a measuring tape or ruler to measure in INCHES the length of each side. Make notes as to where the sink, stove and fridge are. Don’t worry if your measurements are not exact, we will recheck them at template. For pricing purposes, we charge a square foot price based off the square foot of material required to manufacture your countertop. When looking at prices for granite the basic square foot price typically covers the cost of the deck plus installation, however depending upon the layout, there will be additional fabrication charges for sink cut outs, cook top cutouts, island arches, sink bump outs, etc. When we quote your project, we will walk you thru the process and explain what will be required to complete your project. There are many different colors of granite to choose from for your new countertops! Bring a cabinet door with you, if possible, so we can help you choose what granite color will match your cabinets. We fabricate granite, marble, slate soapstone and engineered stones like Silestone and Caesarstone as well. Once here, we will use your drawing to calculate how many square feet of granite countertops your kitchen or bath requires. Most kitchens are generally around 50 square feet which will use approximately one granite slab, however, larger kitchens may need two or three granite slabs. When we calculate your quote, we will base the price off of the available dimensions, once templated we will re-calculate the square foot and adjust the price accordingly. You will only pay for what we need to fabricate your top. We will review the colors available and help you to determine the best materials to use. We can provide sinks and faucets, as well as tile for backsplashes. We carry a variety of glass mosaics, ceramic, porcelain, marble and travertine tile. We can design a backsplash and help in selecting colors and finishes as well as offer installation. We will create a quote for you and can work with you to come up with a proposal to fit your budget. Once you’ve decided to go forward, we will walk you thru the purchase process, reviewing all information as well as explaining what to expect. Once you’ve paid your deposit we will schedule a template appointment for our technician to come out and template your cabinetry for your new countertop. You can visit our slab yard to view slabs, and we can give you small samples to take home. Unable to make it to the showroom? No problem! You can email your drawing to our showroom. Include all your contact info and any additional information like the what color you’re looking for. We will create a quote using multiple price levels and email it back to you. Then when you have time you can come in and peruse the showroom and check out the hundreds of colors options available. Our scheduling dept. will call you the day before your scheduled template appointment to confirm the appointment and to give you a window of time to expect our crews. Our template crews will review the drawings and check the cabinetry for level, making sure that they are properly installed and plumb. They will create a custom template, reviewing over hangs, radius corners and any details required for the project. Please make sure any appliances that come in contact with the countertop are set and level, i.e., dishwasher, stove or cook tops and fridge. If you have an existing kitchen with a laminate or other type of countertop, we offer services to remove these tops prior to template or during installation. Why remove them for template? Well, we want to do our job to the best of our ability, and by removing to tops at template, it allows our crews to check the cabinetry to make sure they are structurally sound. We check to make sure that they are level and plumb. We can accommodate anything out of level up to a 1/4″. Anything beyond that will require adjustments to be made by re-leveling the cabinetry. We can verify and account for proper overhangs and verify any hidden conditions that otherwise may affect installation. Bottom line, we want to make sure the foundation of the countertops, the base cabinets, are able to accept the granite. If you have brand new cabinets, our template crews will inspect them as well for plumb and level. Any questions or concerns regarding overhangs, edges, cutouts or any other special items required in order to install the counters will be reviewed. If using a contractor to install your new cabinets, make sure he is available on site to answer any questions and voice any concerns. Someone needs to be on site, you or your contractor that can answer questions and verify information. If we have to come back and re-measure or re-template due to no one being on site, there will be an additional trip charged accessed. The better the template the better the countertop. In some instances, we can template on top of existing countertops, and then remove the countertop during the installation phase. The following day after your template, you are requested to come to our fabrication center to review the template and to pick your slab. Once we pull your slab, we will use the templates to configure the layout to fit the slabs. Please take a moment to review the slab, look closely at the surface and note the natural beauty. Granite naturally has very small cracks, fissures and pits in the surface, depending upon the type of materials selected, the amount of these will vary. Take note of the subtle nuances of color and pattern. If there are any defects or issues on the slab, we will identify them and omit them if requested. We will review seam locations and verify sink, cook top cut outs or any other fabrications required to produce the countertop. We review the file and template drawing and double check the square foot of material required, the edges, sinks and cutouts, overhangs… all the details of the job. We review all account information and once the balance is paid, we schedule your installation. Our typical turnaround time is 5 working days from review to install. On the day we are scheduled to install your countertop, please prepare the area for us. Move any items that will be in harm’s way. Make sure any items required to be installed like faucets and cook tops are on site. It is best if your stove and dishwasher are set in place, they do not have to be hooked up, but set in place and level. Please allow for 1 to 2 hours for installation depending upon size of the job. We will install the under mount sink to the granite and the epoxy it in place. It is imperative that the sink not be disturbed for minimum of 12 hrs. Once the epoxy is set then the sink can be hooked up and any disposers installed. Our installers will clean up the area and apply sealer to your new countertop. They will review the top and have you sign off on a satisfaction form. Please take time to go over the top and check for any scratches or blemishes, take your hand and wipe them over the surface and visually inspect the tops and our work. Granite naturally has very small cracks, fissures and pits in the surface, these are to be considered normal and are not a defect. If there are any issues, inform the crews and allow them to take care of the issue. Once our crew leaves then any issues to come back will require an additional service charge. If you purchased a customer care kit, review the directions and familiarize yourself with the products. We recommend that you reapply the sealer 24 hours after the installation to ensure a “good” barrier of sealer on your countertop. Follow the maintenance instructions in your customer care kit to keep your countertop looking as good as new. After your new granite countertops are installed, the next step is to simply ENJOY! Nothing compares to the beauty of natural stone. Granite Countertops are a highly durable countertop and beautiful choice for any kitchen or bath.